For some strange reason, the database permanently deleted this thread when I made it into a "sticky". I was able to copy and paste it from another open window, but as you'll see, it's far from perfect. 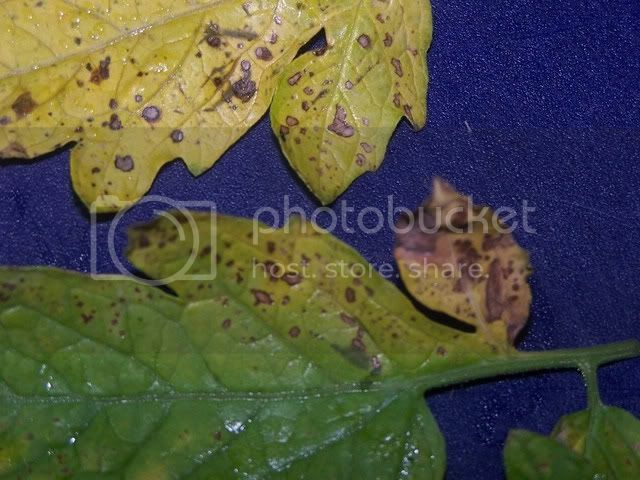 From researching it, I am guessing a few of my plants have septoria - photos follow (I hope) - does that appear correct? I have been spraying with chlorothalonil - which is what I believe the frequently recommended Daconil is. However, my brand is concentrated Ortho Max Garden Disease Control. Should that suffice? Is there any difference between the brands? I'm not sure I've seen Daconil in the stores, but I'm not sure about that. Most of my plants are fine, but I am having trouble controlling the disease on a few. I've picked off the yellow leaves, and I spray weekly (or more after rain). One of the poor things will be bald soon though if this keeps up. Can I get your wisdom on this one? Thank you - I do understand that. But I thought if you kept the plant well sprayed, and removed diseased foliage, that perhaps the remaining foliage could stay disease free? Or am I mistaken, and the disease is systemic and will continue to progress? NO, the disease isn't systemic although stem lesions can be seen. Daconil is an excellent preventive and you're correct in saying that if you keep up a regular spray schedule, making sure to reapply after rain, as well as taking off any diseased leaves, that the plants should do well. Initial infections with Septoria are via air and embedded in rain droplets so if it's in your are there can still be infection via those routes. But if your plants have had Spetoria before then spores are shed to the soil and the next year you can get splashback infection that will infect the lower leaves and then proceed upwards on the plants. Daconil works b'c the molecules bind to the attachment sites on the leaf surface where the spores would normally attach and blocks them from attaching. But it isn't permanent which is why you have to respray. Oh Septoria, I know it well. That's what it looks like and this is the time in summer that it is most active I think. Chlorothalinol won't cure it anymore than any other fungicide. I've been seeing more outbrealks on some of my tomato plants now. There is no magic bullet that will rid you of Septoria Leaf Spot completely, you are outnumbered by the spores. After you think you've got it under control on one plant, it suddenly shows up overnight on another. 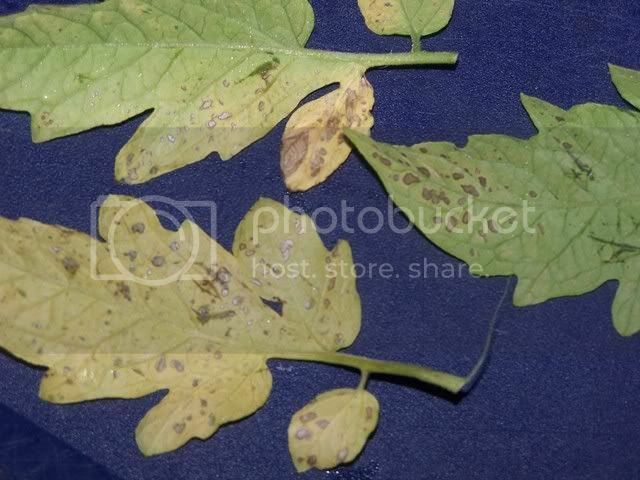 Septoria is not sudden fatal disease like Late Blight, but it's ugly, can defoliate your tomato plants if not controlled and of course reduce your yield. The best control is like you are doing already, remove diseased leaves or branches and dispose of them in a trash bag away from the garden, and spray a preventative fungicide, don't forget to spray the bottom of the leaves also. (critical but easier said than done sometimes). Also weed control is a must since Septoria can be present on some weeds and spread to your tomato plants from there. Choose your weapon, I've used a Chlorothalinol based product before, this year I'm using a copper soap fungicide (Soap Shield) with good results at controlling its spread. Maybe some other folks here have other effective controls they can share. Well luckily (for this reason anyway) I grow in containers, so will have new soil next year. But, I'm sure it can still find a way. I do seem to keep getting more infected foliage, especially on my red pear. Ah well, I'll keep spraying. Is what I'm using as good as Daconil (same chemical)? Or is that brand better somehow? As long as the active ingredient is at least 29.6% Chlorothalonil. You can also sometimes find it in red bottles at Walmart from a different company. Or maybe find even stronger versions. Oh, you can also try Mancozeb or Manzate Pro Stick, which also is effective against Bacterial Spot & Bacterial Speck, etc. I have a concentrate, so I guess I could mix it whatever strength I liked. So far, I have been following the package directions. The label says 29.6% chlorothalinil. The instructions say to mix it 2 1/2 teaspoons per gallon of water. No tam, please don't mix whatever stregth you want to. The amount to use has been titered, sprayed, and then the plants challenged with the various fungal foliage pathogens to see how many molecules are needed to cover all the spore receptor sites on leaf surfaces. No sense in using too much and really bad not to use enough. It's one of the reasons you never want to mix anything else with Daconil ( easier to spell than its chemical name of chlorothalonil) b'c interactions can occur such that there aren't enough molecules to cover the sites. What you want is the concentrate that says 29.6 % chlorothalonil and that's sold by many companies including Ortho, Bonide, etc. I remember one time that someone was complaining that Daconil was not working and after asking some questions it turned out he was using the 12.5% concentrate which is completely non effective. You may want to try 1T/gal, I'm pretty sure that may be the most common label. Or try Manzate or Mancozeb or Dithane 45 (all same based on manganese++ & zinc++, but the Manzate is powder & "industrial strength" version.) Dithane 45 is always available on ebay under the Hi-Yield or Southern Ag brands in pints, Mancozeb is available under Bonide brand, at horseloverz.com & other places, including ebay. P.S. I always have trouble figuring which is Septoria & Bacterial Spot & Speck, could you have diagnosed it wrong? I don't think chlorothalonil works on the Bacterials, (Mancozeb does), maybe that's why it's not working??? Oh nonono Carolyn, I stated that badly. I didn't mean I *would* randomly mix something up. I just meant that if you all thought the concentration was not correct, and advised that it be mixed differently, it was possible. You're absolutely correct of course, people shouldn't mix things not according to label, I didn't mean to say that at all. Korney: Oh, I sure could have diagnosed it wrong - that's just my best guess, and I'm no expert. If something thinks it's something else, I certainly welcome any ideas. Those are certainly good ideas to try - I really wish Red Pear wouldn't die - I like my cherry tomato salad color combination - Black Cherry, Sungold, and Red Pear - it sure would be missing something without the red! According to Darrel, who paid a visit to my garden after tomatopalooza, I am suffering badly with Septoria this year - first time perhaps ever I've seen anything like this. 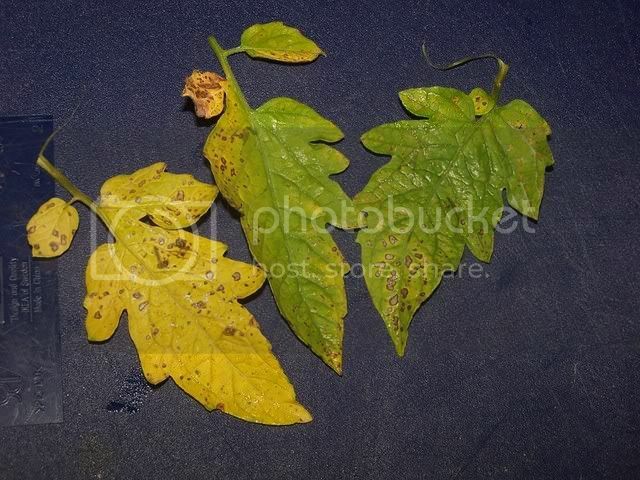 Foliage: EB, LB, Gray leaf mold, Septoria leaf spot, 1.35-2 pts/A; Fruit AN, Alt. Blk. Mold, Botrytis gray mold, LB fruit rot, Rhizoc. Fruit rot, 2.0-2.88 pts/A. 0 DTH. All computers are possessed, that's it. I found Daconil to be good for early blight but very weak against Septoria in my garden. I started alternating with mancozeb a few years ago because of Septoria and have no more problems. Plus Mancozeb goes on the color of pea soup! It blends in nicely! Why not try a test. Try a dilute spray of Clorox on one plant and see if it works for this disease. Mix 8 ounces of regular strength Clorox into a full gallon of water and spray late in the day. I have found this very effective on most foliage diseases that are not systemic. It should cause any diseased leaves to dry up and die within a few days. b54red - I have seen your use of bleach discussed. I guess it would kill fungus on the surface of plants, it certainly kills molds and all. And it must be working well for you of course, or you wouldn't recommend it. I just wonder - it doesn't harm the plants at all? Or the dirt (especially as I am growing in containers)? Or make the tomatoes taste bad (I have a lot of fruit at the moment). Sorry to ask questions, I'm just a little *wowed* that regular 'ol bleach would work so well. I decided to give the Mancozeb a try. How do you folks suggest I alternate? If I'm spraying weekly, and also after rain... One week chlorothalinol, and the next Mancozeb? Or just switch to Mancozeb for now. Or... ? I don't want to be "alarmist", but you may want to do some research before you just go out and buy something. I also use Daconil, but I don't ever remember seeing an Article like this regarding the effects it may have. DNA damage and initiate tumors in fetal cells. For me, if the problem you are trying to solve is mainly cosmetic and not fatal to the plant, I would just live with it, rather than risking the above. Something to think about..
Tam, I've been using it every summer for over 5 years and my worm population has done nothing but get larger and healthier so it can't be doing much damage to the soil. Very little of it gets on the soil since I use a highly pressurized sprayer and a fine spray on the leaves and stems and I don't get a lot of runoff. No it doesn't affect the taste. Remember I'm talking about a very dilute mixture. It oxidizes in a very short time so there is little if any residual effect. The only time it might harm the plants in the strength I am talking about is if you spray it when the midday sun will hit the plants while wet with the solution. In other words don't spray until late in the day near sundown; this is a procedure I use with all foliar sprays to prevent leaf burn. The diseased leaves will wither and die within a day or two after spraying so if you consider that damaging the plant then I guess it does; but it doesn't hurt the healthy parts of the plant or the new growth. As for safety I feel much better using it than any commercially available fungicide. Besides Daconil it is the only 'chemical' fungicide I use in my garden now. Thanks for the information about the bleach method, I do appreciate it. Re. the Mancozeb - I am not so silly as to just buy "something" without research. I even had a family member who knows some toxicology take a look at it. I did see that site, but don't give it a ton of credence honestly. Mancozeb is available to consumers, so I doubt it's tremendously poisonous, despite the claims of an environmental group. I don't intend to bathe in it or anything, so doubt I will shortly come down with cancer. Just because there is one article doesn't concern me - a bunch of scientific studies perhaps would. That same group is against genetically modified crops, Roundup, and all sorts of stuff. Their evidence does not seem to list any actualy scientific studies - rather makingn a vague reference and saying things like "one person got a rash". One person could even be allergic to tomato plants, the pollen that day, or any other thing. It is not scientific evidence. Many, many substances can be carcinogenic, or cause symptoms/problems at high doses. High doses, however, might be bathing in or drinking the stuff. High dose does not usually mean a slight amount of spray drifting. If it did, it would likely be unavailable or a professional product only. According to the United States Environmental Protection Agency, chlorothalonil is a Category I "severe" eye irritant. It is not considered to be acutely toxic by ingestion (its oral LD50 is greater than 10,000 mg/kg), but is toxic when inhaled. In animal tests, long term chlorothalonil exposure resulted in kidney damage. Chlorothalonil is a class B2 "probable carcinogen", based on observations of cancers and tumors of the kidneys and forestomach in laboratory animals fed diets containing chlorothalonil. Chlorothalonil has been implicated in Colony Collapse Disorder. While I do appreciate safety concerns (and I am very careful what I use in my yard, especially anything my dogs might come in contact with, for example I won't get Chemlawn etc.) I also have the personal view that many of the chemicals that have been developed are safe and useful, if used properly. I do thank you though, because I am now reminded to be extra careful while applying sprays - since my tomatoes are pretty tall, I need to be careful to not get stuff all over me, and perhaps shower immediately. Mancozeb seems to be helping, both with the Septoria and the strange "turning brown and crunchy" problem - thank you for the suggestion. I've kept using the chlorothalinol on most of the plants, and just used the mancozeb on the "problem" ones - but so far so good. Applied b54red's suggestion of a dilute bleach foliar & it's done well; gonna add it proportionately to the rotation whenever needed & dispense with the Serenade. Keeping Actinovate, MycoGrow, & Exel-lg. Thanks to you b54red for your helpful ideas. I first used it out of desperation because I had reached the end of my rope with all the expensive sprays applied weekly only to see the plants fail to produce a decent crop despite all the cost and labor. I just wish I had started using it sooner; because it's so cheap and easy to use. You don't need a hazmat suit to apply it and it's gone in no time. I started another experiment today in the worst fusarium ridden bed in my garden. I used the solution in the holes where I am going to plant some more fall tomatoes. I saturated the each of the prepared spots and will wait a day or two to be sure all the Clorox is oxidized. I know this might kill some wigglers but I have plenty and I am only trying it in a few spots. I plan on setting out some varieties that have gotten fusarium so bad they never produced or only made a couple of small green toms before dying. I don't know what will happen or if the Clorox was strong enough to kill fusarium or if sterilizing the spot will do more harm than good. I'm keeping my fingers crossed but really don't have much hope. When I plant I'll try the Root Sheild in a couple of the holes to see if that helps.The trichoderma didn't help at all in this bed; but maybe it needs a chance to get ahead of the fusarium and maybe this will help. All of the June tomatoes planted and treated with Root Sheild have either died from it or are very sick except for Mule Team and Gary O' Sena and they have fusarium but keep hanging on and producing just like when they weren't treated. B54red, have you tried MycoGrow soluble? It has 40 different fungi, trichoderma, & bacteria; compared to just the one in Rootshield. Perhaps the diversity will be of added benefit.